For lovers of authenitic Mexican spice and flavor, prepare to be wowed with these amazing Vegan Chorizo Sausages from Feed Your Head! Made with protein-packed wheat gluten, tequila and just the right amount of heat and spice, they're perfect for grilling to put on a bun, dicing up to add to your favorite recipes, and more. Try crumbling one into a taco and add your favorite toppings for an awesome vegan fiesta! Each 12 oz. 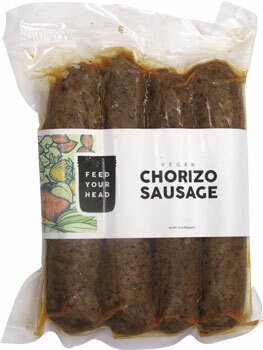 (340g) package contains 4 large Vegan Chorizo Sausages. $5.99 per package.